Yes, I'm still here! I'm 32 weeks pregnant (just 8 weeks until my due date) and I'm taking it easy. I'm still working every day, but I'm limiting my time in the kitchen and I'm spending more time relaxing, sleeping and getting ready for the arrival of Baby Powell. Instead of sharing a recipe today, I'm going to share a series of photos from my iPhone that illustrate what I've been up to in June. I'm eating a ton of Rita's Water Ice. It's a Philly-area favorite and my favorite (only) flavor is lemon. I buy it by the quart and I can eat the whole quart in two days. It's much lighter than ice cream, pleasantly tart, and great for a pregnant lady on a hot day. If I ever move away from Rita's I'll be sad. It's baseball season! As some of you know, my husband loves the Phillies, so our evenings are almost always spent with a game playing in the background. In past years we've been to several games during the season, but I can't take the heat this year. Fortunately, we were able to score some seats in the shaded and air-conditioned Hall of Fame Club this past Sunday, so I was able to enjoy a game live and in person. And the Phillies lost. Go figure. They aren't doing so well this year. I still had fun. I'm doing the best I can to prepare for my new role as mama to this baby of ours. We've spent evenings in breastfeeding class, newborn class and childbirth class. I'm even reading this book that's supposed to teach me how to soothe my crying baby. Yes, I'm overwhelmed, but I'm also excited! And I'll let you know if the book works for us. I don't feel like cooking every night. When I do cook, I often forget to pull out the camera. We go out to eat often. 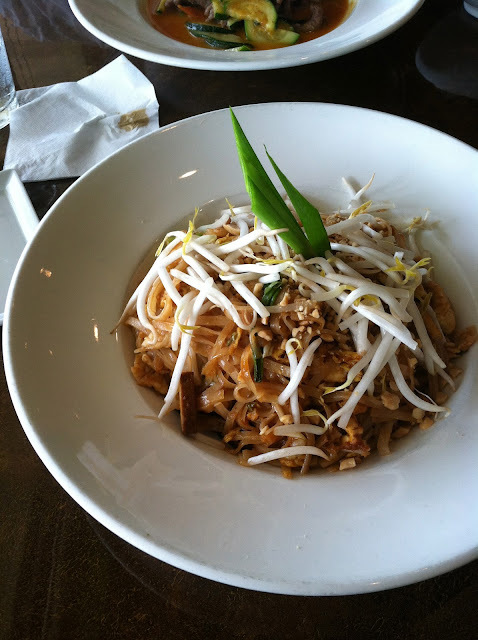 This is some pad thai that I enjoyed (courtesy of a Groupon... check out that site!) a few weeks ago. I miss cooking. I'm looking forward to getting back to my routine soon. Part of my lack of desire to cook comes from my small appetite. This bowl of pad thai lasted me three meals. I have no idea what's going on, but my stomach seems to have shrunk. I thought pregnant ladies were supposed to be hungry all the time? E and I celebrated our 10-year college reunion this month. This photo is from a booth that was set up at the event. I can't believe I graduated from college a decade ago. I also can't believe that I've known this man for almost 14 years. We go waaay back. Back to the days of Tommy Hillfiger t-shirts, pagers, and Timberland boots. Back to living in an un-air conditioned dorm room and having no car. Back to eating all of our meals in the dining hall and treating ourselves to midnight pizza delivery with Tropicana Twist from 7-11. Yeah, we go way back. I love this man and I'm looking forward to our next adventure as mom and dad to this cute little kid. So cooking? Not so much at the moment (although I did make some killer blueberry pancakes yesterday and I'm in the process of writing a few product reviews for Potluck, the ShopRite blog). I'd love to do some summer canning, particularly something with berries, so we'll see how July goes. What have you been up to? Any graduations, reunions? Is anyone else relying on takeout? Please don't tell me I'm the only lazy/busy one out there. Can you call it lazy when you're pregnant in the heat of the summer? I believe the answer is 'No, no you cannot.' :) Looks like your summer is off to a good start though! Great photos! Nope, I get takeout too when i get too busy or don't feel like cooking. When you have a busy life sometimes takeout or shortcuts make life so much easier. Looks like y'all had fun, one of these days I'll have to try Rita's.